Berkshire Hathaway has released its Buckhead real estate market update for January 2018 and it looks like 2018 was off to a slow start. However, I believe it is related to the weather we experienced here and not the demand. I do see activity picking up in February and a sense of urgency with the threat of higher interest rates on the horizon. We have basically 3 markets going on right now. If a buyer is looking under $500,000 they can be prepared for a bidding war with multiple offers on properties that are priced right. That’s particularly true in the under $350k price range. Buyers that are looking from $500k-$1.5M can expect an even balance of buyers and sellers and should expect to pay comparable pricing to last year with little increase in pricing. The buyers in the over $2M price range are in a buyers market and should expect to get deals. There is about 4 years of inventory out there and plenty to pick from. These buyers may have a high cash percentage as a down payment but due to the higher price points they are particularly sensitive to interest rate increases. As always, your home is unique and as such requires an expert to help you price. Hitting the range at the right price will help you sell in a reasonable amount of time. I pride myself on my recommendations, not that all of my clients take them, but I’m confident in the analysis and getting your home sold rapidly if it is within the range. We are ready to help you take the most advantage of this upcoming Spring market! The identity of the out-of-state mystery buyer for Tyler Perry’s Buckhead estate has been revealed: Evangelist David Turner’s purchase of the 17 acre estate made history as the most expensive real estate transaction in Atlanta history at $17.5 million in May 2016. According to the Buckhead Patch , Turner, a former businessman made his fortune in the specialty food business before becoming an evangelist and starting David Turner International Ministries. He purchased the Tyler Perry estate after feeling that “God told him to come here and buy the house” according to Buckhead.com. An evangelist purchasing an expensive home isn’t new news around the South. Joel Osteen and his wife Victoria purchased a $10.5M home in the River Oaks neighborhood of Houston Texas in 2010 according to Houston.CultureMap.com. Atlanta.Curbed.comAtlanta.Curbed.com reports that Atlanta pastor Creflo Dollar lives on a sprawling 183 acre estate in Fayette County Georgia. The home was originally built in 1996 but has been renovated and expanded in recent years to include multiple wings and over 17,000 square feet. Dollar is also said to own an apartment in NYC valued at $2.4 million dollars. On a slightly less grand scale is Charlotte, NC pastor Steven Furtick who built a 16,000 square foot gated estate in Waxhaw, NC. One of the largest homes in the metro area with 5 bedrooms and 7.5 bathrooms, it has a tax value of $1.6 million and sits on 19 wooded acres. The 33 year old pastor lives in the home that he has described as “a gift from God” with his wife Holly. In Dallas, Bishop T.D. Jakes lives in a 15,000 square foot home in Ft Worth Texas, purchased in 2004 for $5.575 million. The property features a private lake, swimming pool and tennis court. Founder of The Potter’s House Ministry, Jakes is an author has also been involved in the Christian film industry as a producer, actor, and writer. In an interesting connection, Tyler Perry directed and adaptation of one of T.D. Jake’s books- small world! Summer is here and we are all looking for things to do with our children. 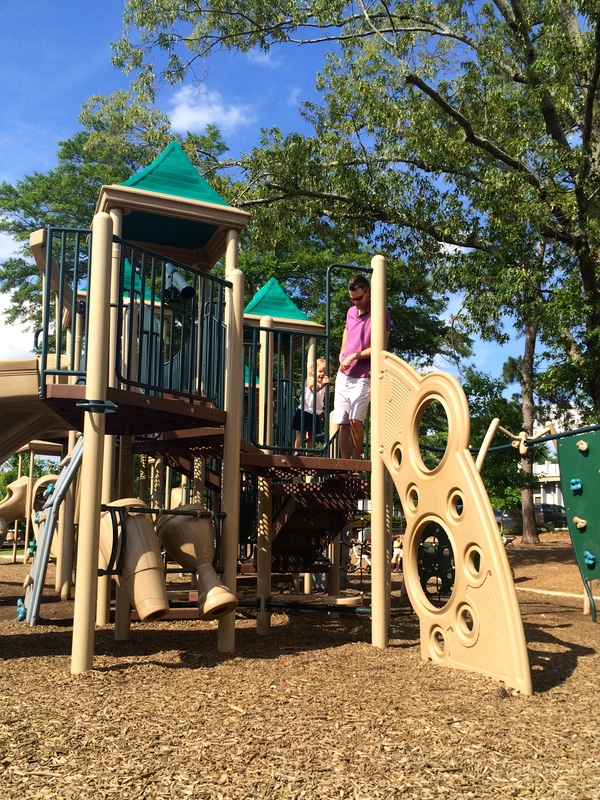 I ran across this great article – a list of Atlanta’s Top 10 Parks and Playground. Some of these might be old favorites, but it’s always good to learn about new parks when you need to mix up your summer routine. Before summer starts to swelter here in Hotlanta, it is time to take this outside, parents. We scoured the city and rounded up 10 playgrounds that are a breath of fresh air and a guaranteed boredom buster. These parks have something for everyone—even the grown-ups. Consider this your bitty’s bucket list. Enjoy! Vinings: Cochise Riverview Club (members only): we have our own great playground by the pool. Smyrna: There is a great playground by St Benedict’s. It is very clean, and young and older kids both enjoy this one. Smyrna: Just up Atlanta Road is Taylor-Brawner Park. Besides having a great playground, it is also the site for Smyrna Food Truck Tuesdays. Take your kids for the playground and stay for dinner or popsicles. Buckhead: Beaverbrook Park. It’s very quiet and has a lot of shade for these hot, summer days. Rainy Days: We’ve all used McDonalds and Chick Fila in a pinch or on a rainy day – can’t beat it. Are any of these your favorites? If not, where are your go-to playgrounds or parks? UPDATE 2/24/2014 Bieber tweeted that he never even looked at this home. There was even a stunt by morning DJ’s that has been published to make fun of the whole thing. Anyway, he’s here in a rental but this is NOT going to be his house. Great publicity for the agent and great exposure for the house is all that really came out of the rumor. Atlanta is home to many celebrities, and it looks like another one might be heading our way. Justin Bieber has been looking to make Atlanta his home so he can be closer to the thriving hip hop community. 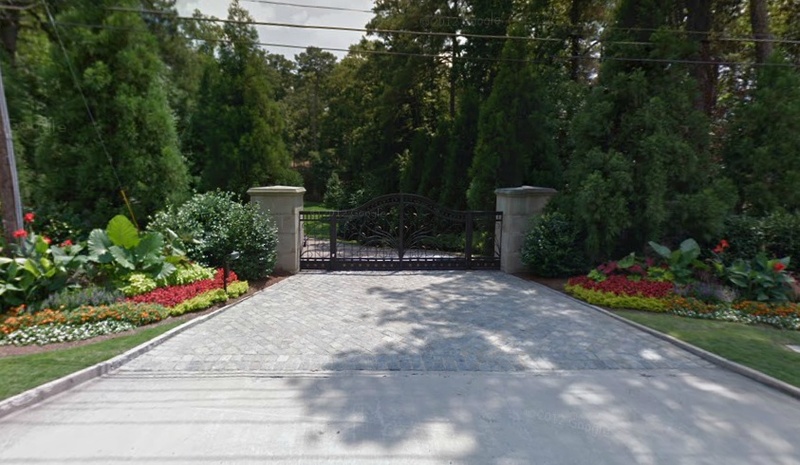 According to TMZ, he has his eye on a sprawling estate off Blackland Road in Buckhead. Listed at $10,950,000, this 16,000 sq. ft., 7 bedroom/13 bathroom home has a lot to offer from energy efficient geothermal HVAC systems to a 70 foot pool/spa, gym, elevator and much, much more. It is yet to be seen whether he really is interested or if this is just a way to generate interest in this property. According to his published interests – can’t be visible from the street (preferably secluded on 5+ acres), minimum of 10,000+ sq. ft., and lists for between $4 and $10 mil., this may not be the home for him. While the price and size may suit him, we’ll have to see whether he will settle for less acreage; the lot is listed at less than two acres. Until the property is sold, any number of things can happen. One of my friends would be his neighbor if he did choose this home, she mentioned that she’d stop by with a welcome basket of a couple of dozen eggs :-). 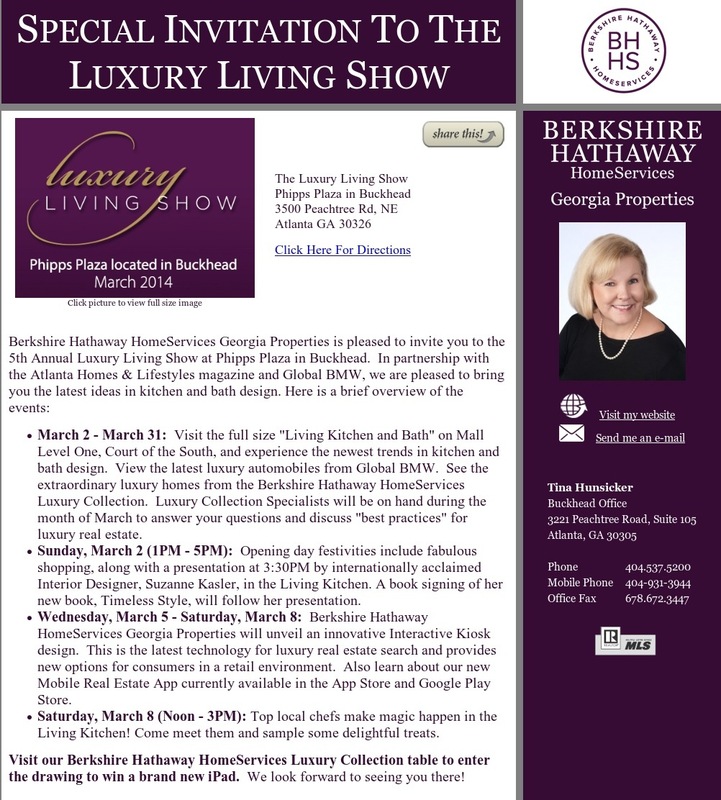 I’ll be sure to keep you posted as I always do about celebrity home purchases in Atlanta. Generally, Vinings is its own unique market. Our sales in September remained the same as a year ago and down 44% from last month, while inventories went up slightly. Days on Market went way down. I believe is because many buyers are patiently waiting for the right house to pop up, and when it does, they grab it. If you don’t get your buyer in the first couple of weeks, it may be on market a while as the inventory has remained somewhat stable or slightly higher in Vinings. We don’t seem to have the shortage of supply that Buckhead has, but our area is so much smaller that the right house at the right price can be hard to find. And on to the Buckhead market: We didn’t see a big change from September to October, but year to year the news is still good. Days on Market is down 31% from last year and available listings are down 28%. Compared to the previous month, sales in September were down, but can be expected at this time of year. We are seeing the return of the trade-up buyer. Confidence in their ability to sell their current home is again allowing buyers to take that step to a bigger home. This is a change in the “downsizing” trend we saw while the economy was down. There is still a 4 year Inventory over $2M, so that market is still slow, but the $1M-$2M market is better than it has been. Even though my blog is titled Real Vinings Buckhead, I’ve decided to add information on Smyrna as well. I’ve sold so many homes there recently and currently have several available listings there. It’s always interesting to me how different all three of these markets are. Buckhead, by definition, is a much larger geographic area and has many more high priced homes. Because of this, its numbers are highly affected by the luxury homes market and the more “average” homes – which happen to range around $600,000 – still fly off the market. In Vinings (30339,) the homes average closer to the $500,000 range with two lots selling at that price in the past month as well. Existing inventory is primarily the original 1960’s homes (both original and remodeled) and newer construction that ranges well over $1M. The Smyrna market, on the other hand, was much more affordable with the average over the past year being around $300,000. This year we are seeing the higher priced homes in Smyrna coming back on the market and selling. Because of this, the affordably priced homes are eaten up and the higher priced homes are driving the price point up causing a drop in the volume of transactions. I’ve seen homes in the $500,000 range get snatched up over the past few months, where a year ago I could count on one hand the number of homes in Smyrna that sold over $500,000. I should add that these reports are for 30080 Smyrna, and not Mableton per se. The statistics back me up with the sales in Smyrna being down 14% year over year and down 26% month to month. As always, please contact me with any questions you have about buying or selling your home. Knowing what is going on in the real estate market is just as important when selling your home as it is when you are buying. One of the great features that has come with joining Prudential is a monthly market update that is quick and concise. Below, I’ve included links to the Buckhead and Vinings September updates. What you’ll notice in the Buckhead data is the dramatic fall off of sales in August. Normally, I would think this drop is related to back to school, but this year the decrease was more dramatic than in years past. Vinings was more stable from July to August. I believe the uptick in sales prices is related to the Jumbo rates being lower than conventional financing right now. In both markets you’ll see that inventory is down dramatically. If you are interested, I’m happy to pull YTD data for you as well. As always, if you’re thinking about selling, give me a call so I can help you analyze the value of your home. Natural Kudzu Removal in Buckhead and throughout Atlanta – The Secret is in the Sheep! My son and I recently drove through Buckhead and saw an unusual site – a small herd of sheep and goats grazing along in a private yard on Ridgewood. We were both enthralled and pulled over to see what was going on! A small herd of sheep and goats on Ridgewood Drive in Buckhead! They hired the herd to eat all the ivy off of the 2 acres. It was so cool. This yard had about two acres of overgrowth to clear, and the folks at EWE-niversally Greeen were called in rather than using harsh chemicals. The flock of sheep and goats, along with a couple of very proective sheep dogs spent a couple of weeks at the Ridgwood home. Protected by the temporary fencing and daily visits from the herder himself, the sheep and goats were left to do what they do best – eat! My son is holding a baby that was born 6 hours before he held him. We are going to have to move to a farm sometime soon. I want that baby lamb he’s holding. Dogs come with the sheep to protect them from coyotes. The dogs are NOT friendly they are there to protect the sheep, so beware. Also I found out that coyotes have a hard time seeing black sheep and goats. EWE-niversally Green was featured in an article in the AJC – read it by clicking here. Before the herd arrived – a private backyard in Atlanta. And the after shot – wow! No green remains! Atlanta’s real estate market is busy and is heating up! I have two of my own listings under contract – both in the Vinings/Smyrna areas. Also, I’m representing a buyer in Buckhead on a $2M+ home. We’re always looking for great homes to sell, as the buyers are starting to come out of the wood work. Let me know if you’re considering a change in your real estate portfolio! This home in West Vinings on Zermatt Drive is under contract. Originally offered for $535,000, and listed by Tina Hunsicker. UNDER CONTRACT IN Smyrna – West Vinings. 4207 Zermatt Drive, Smyrna, GA 30080. Light and Bright interiors with 10ft ceilings and all hardwoods on the main, porches everywhere! Huge master suite with fabulous walk in closet, 3 additional bedrooms each with its own bath, extremely well maintained neighborhood walkable to restaurants and shops at One Ivy Walk, kitchen has stainless appliances, newest house in the neighborhood. Square footage does not include basement. Tina Hunsicker . A Buckhead treasure, this home at 3111 Ridgewood is under contract. The original list price was $2,485,000. The buyer is represented by Tina Hunsicker. IMAGE: FMLS. UNDER CONTRACT IN Buckhead. 3111 Ridgewood Road, Atlanta, GA 30327. This flawlessly designed home by Bill Harrison was published in his book Timeless Architecture for its use of rough materials in a refined manner. All of the bedrooms have en suite baths, large spaces that allow for natural light, and a whole-home generator. The master bath has heated floors, steam shower, sep. his/her toilet stalls & closets. To enjoy the mild southern weather, the owners designed the home w/ ample outdoors spaces on this private 1.5 +/- acre lot. There is a 5-hole putting green, outdoor living room, fireside cabana, gardens, and mature landscaping. The buyer is represented by Tina Hunsicker. This home at 4300 Brookview Drive, Atlanta, GA 30339, is the ultimate in Vinings convenience. Originally offered for $499,900, and now under contract. Tina Hunsicker represents the seller in this transaction. UNDER CONTRACT IN Vinings. 4300 Brookview Drive, Atlanta, GA 30339. New windows, HVAC, A/C, fencing. No RR tracks, beautiful large yard, move in ready, all hardwoods, screened porch and deck overlooking yard, unfinished basement with good ceiling height and fireplace. Originally offered for $499,900, and now under contract. Tina Hunsicker represents the seller in this transaction. Yes, we do have a home available in Buckhead, in 30327, on Paces Ferry to be exact, for $28 Million. Sitting high atop the Chattahoochee River on 10 acres…..the only thing I can imagine one would have to complain about is the Lovett School car pool lines. I remember when the current owner bought the land…it was $10M alone and I’m sure this house is being sold at a loss. This estate has every feature and amenity any executive or celebrity would want. I have not personally been in the home, but it is a pocket listing in town! But please don’t just call me up and ask to see these fabulous homes….as with most multi-million dollar properties, you’ll need proof of funds from a local bank and references that can be verified before we’ll show you. I won’t mention the celebrity’s name who owns this home at the request of the agent, but those of you that live nearby will know the house. The next question is: Where is he going? I don’t know. But don’t worry, he’s not leaving Atlanta. So below is a little bit about the top four most expensive homes for sale in metro Atlanta as we start looking at 2013. 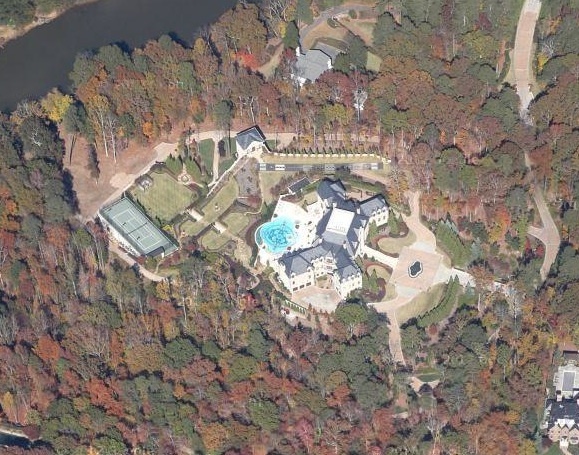 An aerial shot of the most expensive home for sale in Atlanta in 2013. It’s on over 10 acres with an incredible view of the Chattahoochee River. This aerial photo has already been used to introduce the property to potential buyers. $28M Image: Google Earth. Here’s another image from Google Earth of the front gates to this incredible compound in 30327. 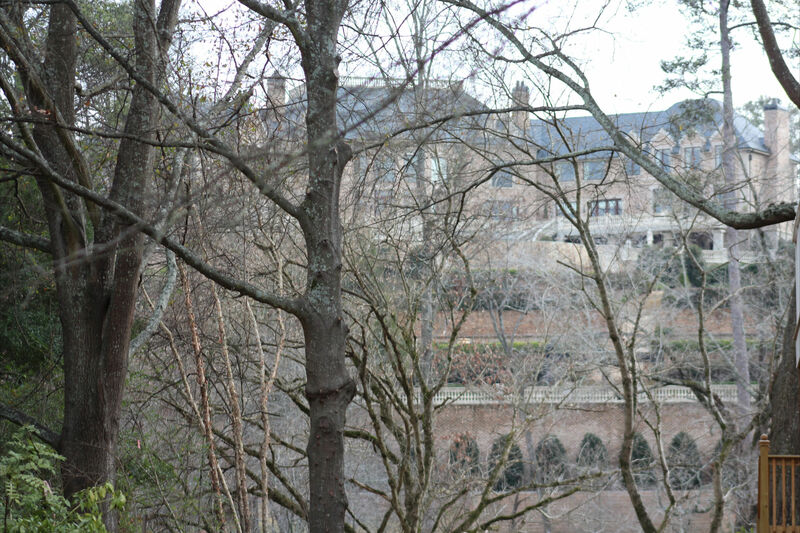 A snapshot I took through the trees looking onto the back of the property that overlooks the Chattahoochee into Vinings. The estate is said to have every amenity, even it’s own multi-story parking garage (yes, I said GARAGE!). There two other homes over $15M available, one on Lake Lanier and the other on West Paces Ferry for $19,900,000. This compound located in Flowery Branch, GA is just north of Atlanta and is on the shores of Lake Lanier. Offered at $19,900,000. Listed by Atlanta Fine Homes Sotheby’s International Realty. Click on the image for additional information and more photos. An Atlanta icon, 490 West Paces Ferry is in the heart of Buckhead and is ultra-glamorous. Offered at $19,900,000, Listed by Atlanta Fine Homes Sotheby’s International Realty. Click on the image for additional information and more photos. You are currently browsing the archives for the Buckhead category.